In a dusty cellar on the outskirts of Vienna, the smell of coffee lingers incongruously in the air. The space is deceptive, looking like a cross between an abandoned greenhouse and an abattoir—and yet, there are signs of life. Mushrooms sprout from towers of perforated buckets and row upon row of hanging bags. Our tour of urban production in the city begins here in Brigittenau, the 20th district. Manuel Bornbaum and Florian Hofer cultivate oyster mushrooms in a rather unusual way—using coffee grounds as soil. Originally from Upper Austria, the two students have established a zero-waste project—soon to celebrate its first anniversary—in the city’s center. Vienna’s urban area, packed with coffeehouses, offers the duo an inexhaustible breeding ground, quite literally. The two newly anointed mushroom growers are responding to a global problem: The demand for food is growing proportionally to the population, but the earth isn’t growing with it. Looking for an alternative space for farming and locally grown food, the city has become a testing ground for new forms of production. In backyards and cellars, gardens and parks anything from oyster mushrooms, escargot, red beets to lettuce can be found growing. The niche market is particularly booming in Vienna, a city with a tradition of fine dining and market culture. In addition to practical benefits including shorter distribution channels and the opportunity for producers to work more closely together, urban production also strengthens the creative character of cities like Vienna. 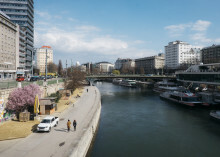 Elisabeth Noever-Ginthoer from departure, the creative center of the Vienna Business Agency elaborates, “It’s essential for cities to be able to retain their creative personnel. Creative and skilled craftspeople and their products play a large role in building a society’s sense of identity and shaping its cultural output.” Through its funding competition “Crafted in Vienna”, the Vienna Business Agency and departure support creative businesspeople and entrepreneurs in the field of urban production. Hut & Stiel have themselves benefited from this program, placing second in last year’s ideas competition. 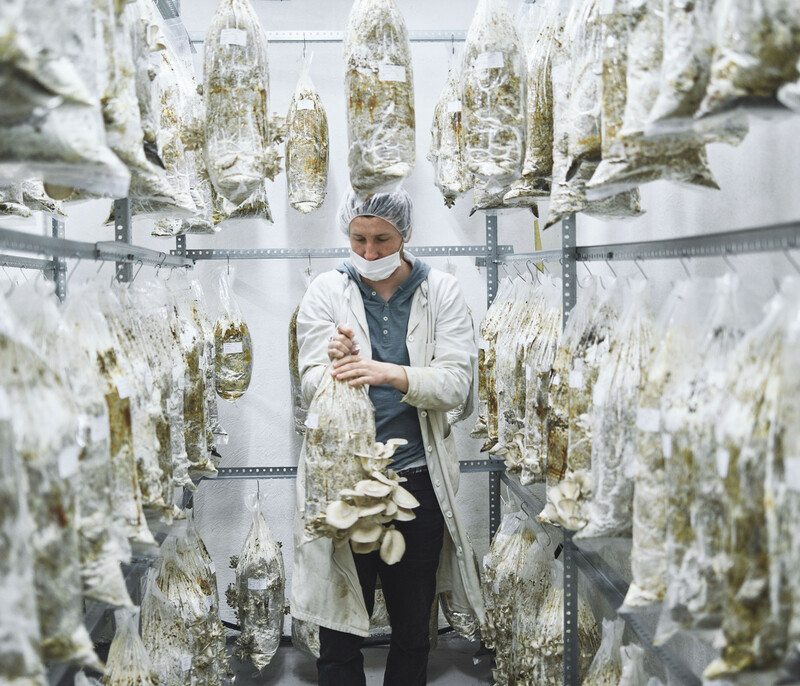 With their expert knowledge, we take closer look at their urban mushroom farm and embark on a tour of Vienna’s urban production sites, with Manuel and Florian’s oyster mushroom serving as the link between each stop. The Hut & Stiel building houses the production facility and office all in one. Nothing on the exterior reveals anything about the goings-on below, though, go down a few steps, and you’ll find yourself in the basement: a 200 square meter urban mushroom farm, where around 120 oyster mushrooms are harvested each week. At the time of our visit, their outdoor garden looks more like a storage room. An electric delivery bike is parked under a makeshift tin shed. 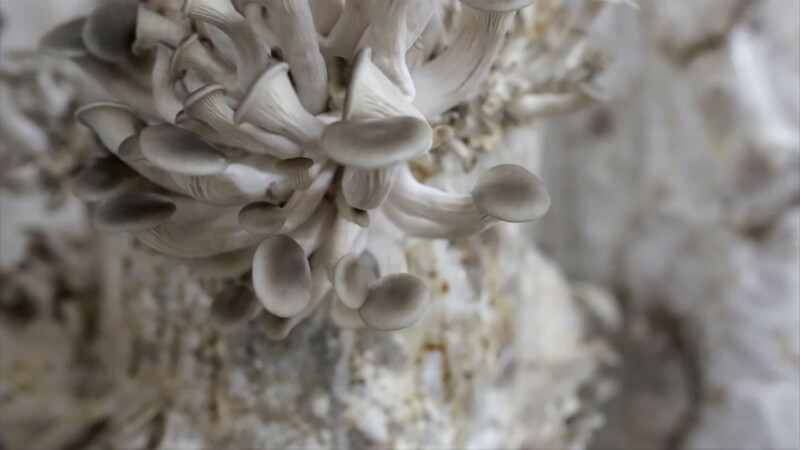 It’s tasked with collecting coffee grounds from cafes and homes for the elderly, and delivering the harvested oyster mushrooms. Once the grounds are used, they are placed in an old abandoned barn where they are composted and become part of the earth again. The cycle is completed. So how exactly does the cultivation of mushrooms work? Florian: You can imagine fungus as having two life stages. The first stage takes place in the back of the cellar. At this stage, you don’t see the fungus itself. The cellar is dark and warm and every single grain of coffee substrate is colonized by the mycelium. When the fungus then develops the fruiting body, the second phase begins and the fungus sprouts from the soil and can be harvested. The infrastructure of a city like Vienna intersects really well with your concept. Florian: Yes, the concept of the coffee grounds only works in the city—in the countryside, it would not be sustainable because of the larger distances. We use coffee because it is great in terms of structure, it’s grainy. There’s also an infinite supply of it in the city. For us, raising awareness is very important. 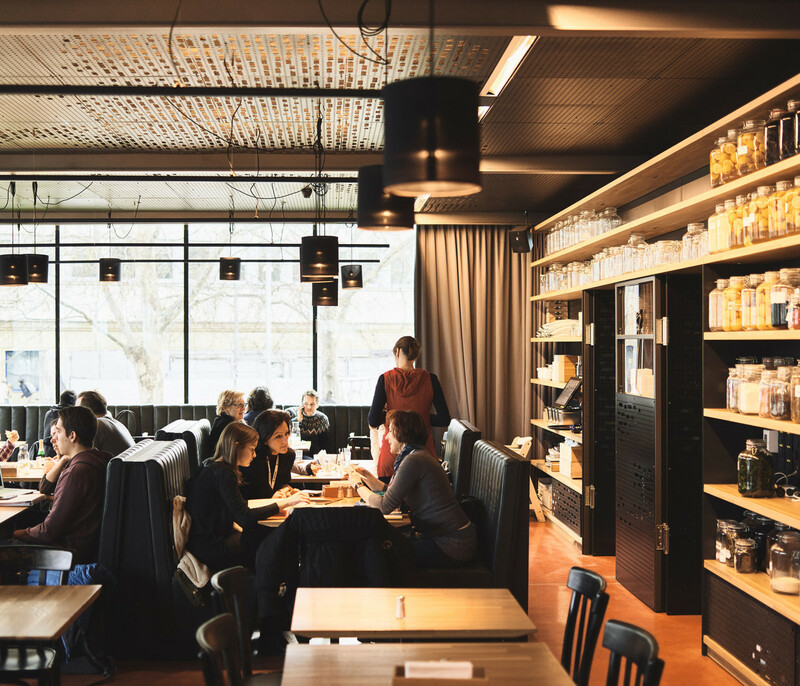 We feel like the relationship with food is starting to disappear in cities. Through this kind of regional project we give a lot of people the opportunity to question where their food comes from. The only catch to your zero-waste concept seems to be the plastic bags that the mushrooms grow in. Why not use a degradable material? Florian: Bioplastic doesn’t work at all because the fungus attacks it and it’s too permeable and lets in the air. It dries out the substrate too much. Right now we’re trying to switch to using the milk buckets that the coffee is delivered in. But, we’re still in the trial phase. In Andrea Lunzer’s small shop, everyone seems to know each other—it’s just five minutes from Hut & Stiel’s urban mushroom farm. 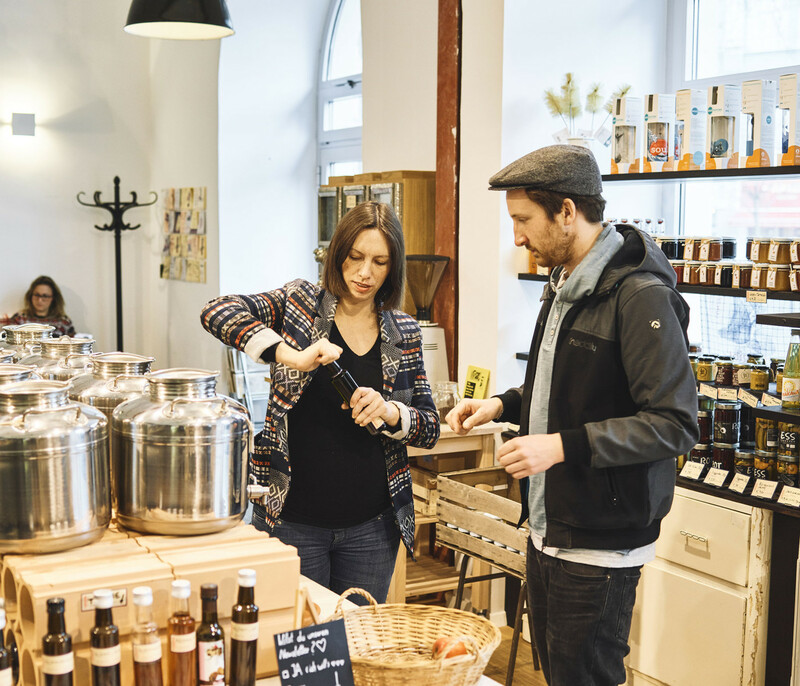 Lunzer’s store is the first packaging-free supermarket in Austria, where you can buy anything—as long as it is in season and is produced regionally. Disposable packaging is nowhere to be found here; instead the containers are brought from home. Hut & Stiel deliver two to three kilograms of oyster mushrooms per week on their delivery bike. The zero-waste mushroom fits perfectly into the packaging-free shop: standing on shelves next to homemade jams are jars of oyster mushroom spread, sauce, and pesto that the farmers make from the less visually-appealing specimens. You also sell the raw oyster mushrooms. What do your customers think about them? Andrea: Usually the customer sees the mushroom and just buys the produce without knowing the story behind it. When customers learn more, they’re always pleasantly surprised and impressed. The fact that the mushrooms are produced in the 20th district—basically our neighboring district—is a definite plus. Does your shop sell other urban produce? Andrea: All products from the “Iss Mich” [“Eat Me”] food suppliers are produced in Vienna, as are the “Eat Lenis” granola snacks. Both producers utilize the city to create at least a part of their products. But urban production depends more on the product itself—for example, if you want to grow carrots you need large fields. With that said, you won’t ever find these in the city. Vienna is very easily accessible compared to other major cities. The Marchfeld, Weinviertel [wine quarter], or Seewinkel districts have always been supply sources for the city—each are only about an hour away. 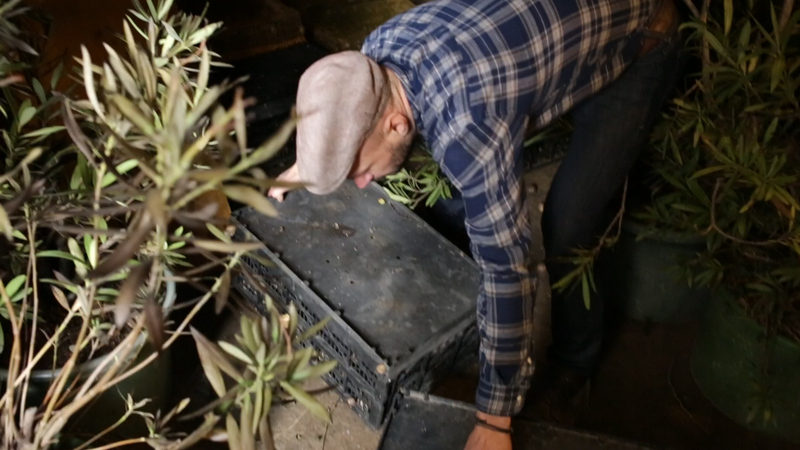 Our journey takes us to Andreas Gugumuck’s farm, which also is entirely dedicated to urban production. Gugumuck, who studied business economics, grew up on a farm, which has been in his family for more than 400 years. Located on the outskirts of Vienna, he breeds 200,000 snails annually and operates a small bistro alongside this. For Andreas Gugumuck snails provide a logical connection between Viennese tradition and food for the future. The cultivation of this culinary speciality uses fewer resources and less energy than say, beef production. In the bistro, the snails are freshly prepared and then cooked. Chef Dominik Hayduck has created a tasting of dishes for us to try: snails, oyster mushrooms, and crayfish seared in sunflower oil and served with wakame on parsnip puree. After the main course of Viennese escargots au gratin, roasted with parmesan and rosemary butter, an exotic dessert concludes the meal: a snail on a popsicle stick, covered with fine dark chocolate. And with that, any preconceptions of slimy snails are quickly overruled. So then, how does one “butcher” a snail? Andreas: “Butcher” sounds as if it is very brutal. If there are favorable conditions and temperatures in summer, the snails will sleep for days. They are then in a dry, rigid state and can be harvested. They are killed within a matter of seconds in boiling water. We have the same guidelines as a slaughterhouse, but we make it as humane as possible. In Vienna, the snail has a history. It’s one that goes far back and one that you would like to revive. Andreas: Vienna was once the global snail capital, back then you could eat more snails here than, say, in Paris. Snails even had their own marketplace in the middle of Vienna. Does tradition play a major role for you? Andreas: Yes, most definitely. I don’t want to necessarily preserve the tradition the way it once was, but rather allow it to thrive and live on in a modern way. That’s why we have reinterpreted the snail as a “fast food”. From the outskirts we find ourselves back in the city center, at Vienna’s Karlsplatz. There in Ressel Park is a large glass cube that the not-so-ordinary Heuer restaurant shares with the Kunsthalle Wien. In the kitchen, the focus is on local food—naturally, the Hut & Stiel mushrooms find their way into the cuisine. 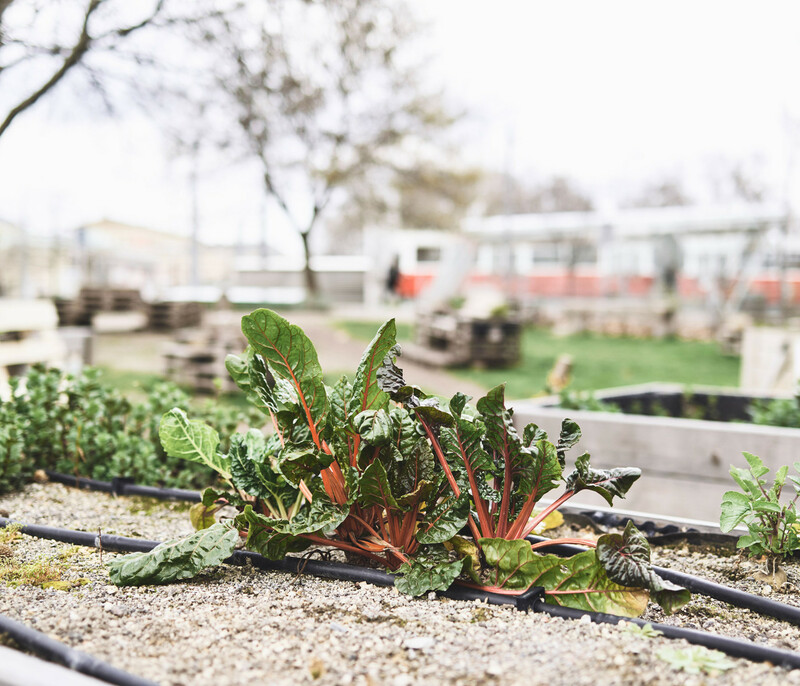 Flanked by Vienna’s smallest vineyard and the Karls Garten urban gardening project, Heuer finds itself in the middle of the urban farming hotspot. With 50 kilos of coffee grounds and 20 kilos of “recycled” oyster mushrooms, the restaurant is Hut & Stiel’s most important partner. Both share a love of staying regional and recycling as many components of food production as possible. As a specialty of the house are the ‘shrubs’: vinegar-based syrups, made with vinegar and used by chef Peter Fallnbügl to prepare seasonal highlights. The shrubs are used in lemonades, as well as the many other pickled items and lined up on a wall of shelves that decorate the restaurant. You get the feeling that this is more than a restaurant. Peter: Absolutely. We cooperate with many small, local producers, manufacturers, and farmers. We don’t purchase our products from wholesale markets, we’re really a melting pot of urban gardening from Karls Garten to the guys at Hut & Stiel. You don’t follow the typical program of a Viennese inn, the type that tends to serve schnitzel and the like. How would you describe your menu? Peter: A lot of what I cook, I ate as a child at my grandma’s house or is what I know from London and Switzerland. I cook curries much less because they are now available everywhere. I would rather say, everything [that I cook] has to do with the quality and product itself. First, prepare oyster mushrooms. The stems are often very hard and are better trimmed. Sauté mushrooms in olive oil, add salt and pepper—or even better—grill them on an open fire. On 4 pieces of flatbread spread 1 tablespoon tapenade, add the sautéed mushrooms, then sprinkle the goat cheese. Top with arugula and some mayonnaise, then place another piece of bread on top. Briefly place finished mushroom flatbread in the oven to melt cheese. Just a few steps away from Heuer is Karls Garten, where vegetables are grown right in the middle of town. The focus is specifically on the old varieties of vegetables, which are grown in raised beds. In the summer, activities including movies, concerts, and small festivals turn the vegetable garden into a cultural center. We meet project manager Simone Rongitsch, who tells us more about the idea behind the project. What is the concept behind Karls Garten? Simone: Karls Garten is a show and research garden. We demonstrate how to grow vegetables in the city. We’re also very engaged in how best to grow vegetables in exposed locations such as Karlsplatz, which is surrounded by lots of buildings and traffic. In addition, we are researching a lot into the urban planning-sociological field. You also work together with your neighbors, Heuer. Simone: Yes, this year we will set up a larger earthworm composter where Heuer will compost the organic waste from the restaurant. We’re trying to build a full-circle system—the topsoil will then be used for our plants. Together with Peter, Heuer’s chef, we are continuously experimenting with new plants which he then incorporates into his dishes. Manuel mentioned that you also have oyster mushrooms here? Simone: The guys from Hut & Stiel were supportive of the project from the outset. In the summer they give tours and grow mushrooms on a small-scale here. We’re all kind of mini farmers here in Vienna, that connects us. They also bring buckets filled with their mushrooms and last year we harvested nearly two boxes of them. At our last stop, bread meets wine. 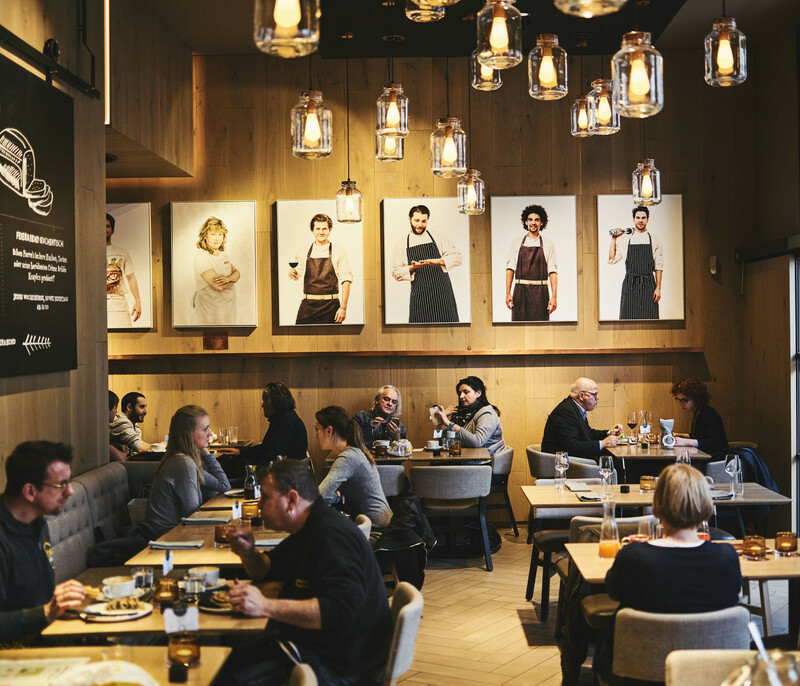 It is 4:00 p.m., the time when Ströck Feierabend, a branch of a Viennese bakery chain, turns into a restaurant. The project is unique and in harmonious symbiosis with Hut & Stiel—one supplies the coffee grounds, the other mushrooms. 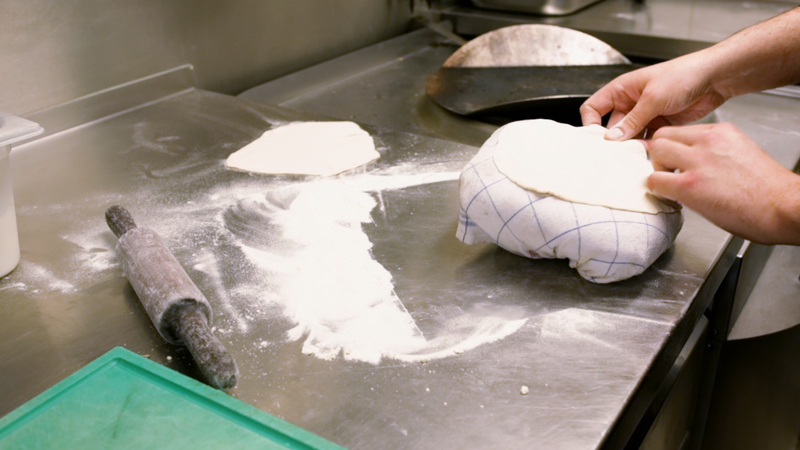 Another unique feature is the combination of ingredients in Ströck Feierabend’s cuisine: all originate exclusively from Austria. The restaurant owns large vegetable gardens on the outskirts of Vienna and in the summer is able to completely sustain itself with its own vegetables. Over dinner and a glass of house wine, we chat with chef Christopher Schramek on regionality and oyster mushrooms. You focus on regional products and source these from nearby farmers. Christopher: Yes, that is important to us because the ecological footprint is also a part of operating a restaurant. An organic mango is indeed better than a normal mango, but we have an abundance of fruit around here. We just wanted to try to make do with what we have. It is important to note that because of the quality of the produce and the personal relationship we have with Hut & Stiel, that we are willing to pay more. And so comes a delightful end to the instructive tour through Vienna—with its hidden gems of urban production The movement offers sustainable and creative solutions for modern food crops and an innovative path to greater environmental awareness, more resources, and, perhaps most importantly for the city, more localized production. A big thank you to Manuel, for showing us around Vienna and to Florian for the insights into mushroom production. Thanks also to the many places and people that we had the great pleasure to get to know throughout the course of our journey. Together with the Vienna Business Agency and its creative center departure, Freunde von Freunden had the chance to tour through the flourishing creative scene of the Austrian capital. Those that hail from Vienna and would like to show its innovative potential, FvF recommends taking part in the Vienna Business Agency’s funding competition, “Crafted in Vienna”. Find more portraits and reports from Vienna’s singular creative scene.